You need to create an account for each support agent who will be responding to chats. Depending on the size of your organization, you might also want to organize these agents into departments, such as Billing or Shipments, to more efficiently direct visitors to an agent who can help them. Note that only one agent is available on Lite plans. Also note that departments are available only on Team, Professional, and Enterprise plans. Team plans are limited to two departments. Each Chat agent needs a dedicated account in order to respond to chats. Each account, in turn, is assigned a role (default or custom) that grants the agent certain permissions. For information on roles, see Understanding default roles in Zendesk Chat and Creating custom roles and assigning users. The steps for creating and updating agents differ based on which version of Zendesk Chat you’re using. For help determining which version you have, see Determining your Zendesk Chat account version. Then click the link below to view your instructions. 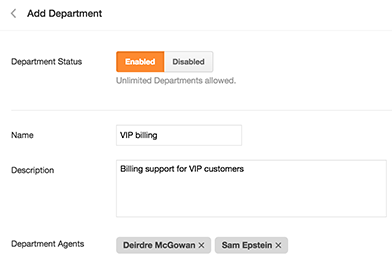 Zendesk Chat Phase 4 customers configure some agent settings in the Admin Center, a central location for managing a number of account settings (including security and billing settings). Read the instructions below for more information on Admin Center settings. Email: The email address the agent uses to log into the dashboard. Role: The role assigned to the agent. Add and configure: Click to create the agent and configure their profile, as described in the procedures below. Add: Click to create the agent, but configure their profile at another time. The agent is enabled and added to your agent list. For information on editing an agent’s profile, see the procedures below. Note: If you are using Zendesk Chat Phase 4 with an integrated Support account, each new Chat agent is also added to your Support account as a Contributor. Contributors in Support have limited privileges; for instance, Contributors can view some tickets, but cannot respond or otherwise interact with them. Contributors do not occupy an agent seat in Support, unless they are manually upgraded to an agent role. If you have a Chat-only Phase 4 account, and later create an integrated Support account, existing Chat agents will be added to your Support account as Contributors. Administrators can update an agent’s profile and settings if needed. Note that the instructions here are for administrators editing another individual’s profile; to edit your own profile (whether you are an agent or administrator), see Editing your personal settings in Zendesk Chat. Chat-specific settings can be edited on the Edit Agent page. Global settings - such as an agent’s name, password, or role, as well as Chat role or enablement status - are managed from the agent’s Admin Center profile. Entries that can be edited on the Edit Agent page are indicated in the next procedure, with instructions for updating Admin Center entries in subsequent procedures. Agent Status: “Enabled” activates the agent upon creation; “Disabled” creates the agent without enabling them. Profile: Opens the agent’s profile in Admin Center. See below for more information. Display Name: The name you want displayed when the agent is chatting with a visitor. This field can be edited here. Chat Limit: The number of chats the agent can take simultaneously. This field can be edited here. Skills: The agent’s capabilities. See Routing chats based on agent skills for information. This field can be edited here. If you’re done, click Save Changes. If you have other updates, see the procedures below. On the Edit Agent page, click the Edit Profile button. The agent’s Admin Center profile opens in a new tab. Click the Products and roles tab. In the Role column, use drop-down to select the new role you want to apply to the agent. In the Enabled column, select the checkbox to enable the individual as a Chat agent; deselect the checkbox to disable them. Click Save, then close the profile tab. On the Edit Agent page, continue making changes, or click Save Changes to exit. Click the Reset Password button. An email is sent to the agent with instructions for resetting their password. The steps for deleting an agent differ, depending on whether your Chat account is integrated with Zendesk Support. If you want to delete an agent from an integrated account, you need to access their Zendesk Support profile. See Deleting Users. In the Permanently delete staff member window, click the checkboxes to acknowledge the warnings presented, then click Delete. Note: Permanently deleting staff member removes the agent and all of their identifiable information from all Zendesk products. This information cannot be recovered, in accordance with GDPR requirements. If you do not want to permanently delete the agent, but want to remove them from your Chat account, you can disable their Chat access. If you set up Chat by creating an account from within Zendesk Support, agents are created and managed in the Support interface instead of the Chat dashboard, including Chat-only agents. For more information, see the Zendesk Support article Adding agents and administrators. Go to your dashboard and select Settings > Departments. Enter relevant details, as shown in the screenshot below. Click agent names to add them to the department. I accidentally added the wrong person as an agent to chat. I know I can deactivate him, but I want to delete it from the list. However what you describe above, is not possible for me. How can I delete this agent? Thanks for your question! If you're not seeing the option to delete the users in the account then your account is likely integrated with a Support account and is not a stand-alone chat instance. In that case the user accounts are linked to the Support instance so to delete a user entirely you would need to do so from inside the Support instance. There isn't a way at this time to just delete their record in Chat once it's been created.